My very good friend’s horse is broken (her words). It is an utter tragedy. This horse is a lovely character, he is handsome and well bred (Rubinstein), a great mover who had fantastic potential; a real gem of a horse and very much loved. Out of respect for my friend I will not go into detail but I tell you this because the irony is weighing heavy on me. Looking out for another horse, insult is added to injury (no pun intended) due to how appallingly difficult it is to find a young warm blood here in the U.K. with pure gaits. I am not suggesting it is easier on the continent either! Pure gaits are so important in dressage because they help create a supple, symmetric horse; developing a healthy muscle structure that supports the spine and the ribcage evenly through every expansion and contraction. Asymmetrical, short stepping horses develop muscular restriction with every step that impairs their health and thus training progress. 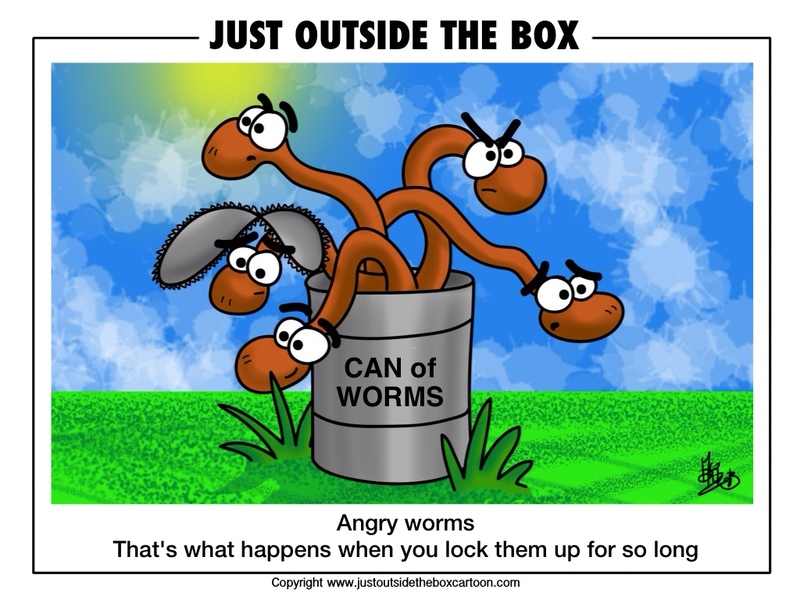 Now I do not want to open up a can of worms, because I have forming views that I do not like, have not completely and fully researched and as yet are unproven. The fact is that we are seeing more and more horses coming to our small yard with asymmetry issues, so much so that in the past 6 months we have begun to specialise in post op, rehabilitation with at least 5 x spine surgeries, 2 x suspensory ops, 2 x dental ops, every single horse some level of remedial farriery – I could go on but it is waaaay too depressing. So, turning to the search for a backed four year old who is ready to start his/her career the focus is one the whole horse and pure even, active gaits. In my view this is a subject that is not talked about often enough. Pure gaits are so important not only in dressage but in all equestrian sports, without pure gaits our horses cannot be supple, symmetric with a healthy muscle structure, supporting the spine evenly through every expansion and contraction. A horse that is tense is usually crooked, often short stepping and is likely to develop muscular restriction with every step and that means health issues and potential behavioural issues as he attempts to communicate his lack of comfort. The problem that happens with the walk is that the beat goes two-time, i.e. the horse walks in lateral pairs of legs, the near hind and fore move together, then the off hind and fore move together. This is normally caused by either tension in the horse or faulty riding which could include rushing the horse, trying to collect the walk too early, too much lateral work in walk without paying attention to the gait. The diagonal pair of legs can be broken by either the foreleg being still on the floor after the hindleg has lifted or by the hind leg being left behind when the fore leg has lifted. 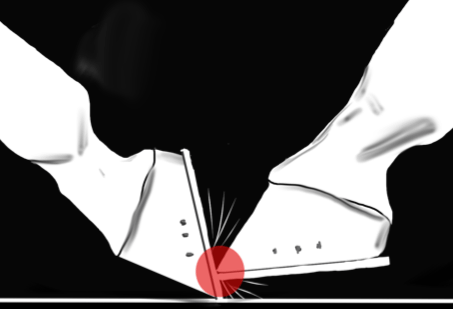 This splitting of the diagonal pairs can be a product of the horse being excessively on the forehand. The horse moves with lateral pairs as opposed to diagonal pairs of legs. The canter is a three-time beat – the outside hind, diagonal pair of inside hind and outside fore then the inside fore, followed by a moment of suspension. The reason that I use inside and outside here is deliberate – because when the horse is going directionally to the right, the canter sequence starts with the left/near hind. When the horse is going directionally to the left, the sequence starts with the right/off hind. Although the inside fore is called the leading leg, it is not the first beat in a canter stride. It is called that due to the fact that it leads out furthest in the canter stride. All legs are lifted off for the moment of suspension. The canter gait may become irregular if the beat goes four- time, i.e. the diagonal pair is broken and there is a ‘roll’ to the gait. When a horse is stiff / lazy the horse sometimes ‘ca-trots’ as I call it. This is when the horse is not fully in the three-beat canter stride and is somewhere between trotting and cantering. The other common problem with the canter is that it can go dis-united. 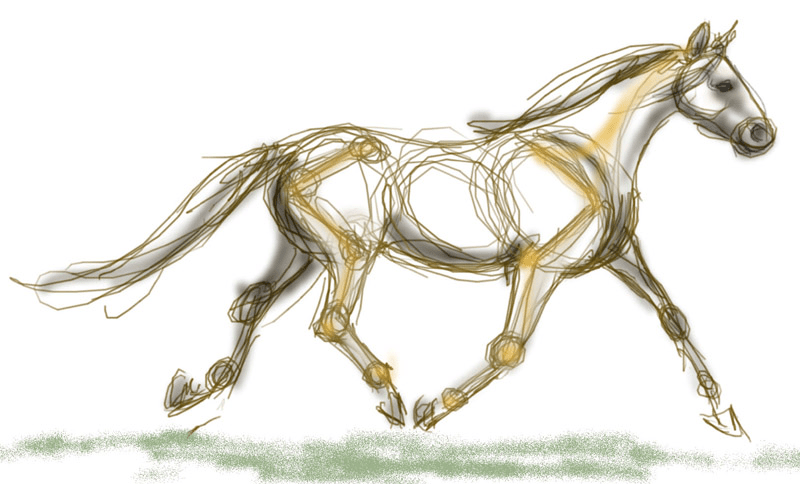 This is when the hind legs are on left-rein lead and the forelegs are on the opposite, or vice versa. Stiffness– If the horse is either laterally or longitudinally stiff there will be the potential for gait irregularities. Using the Back – When the horse does not use his back his legs take much more of a pounding which can result in unsoundness. The hind legs cannot reach underneath his body and they ‘trail out’ behind. Often the toes of the hind feet ‘drag’ in the arena surface. Lacking Purpose – Any gait that is impaired will lack the impression of ‘going somewhere’. Activity in all three gaits is very important for the potential dressage horse. Straightness – This will have an enormous effect on how the horse moves. So, when the rider asks for variations in the length of the strides on a horse that is not straight, the horse will normally show a diagonal irregularity where one diagonal pair will take a greater stride than the other. The lack of straightness and suppleness will prevent you from working on transitions within the gaits and so progress will be very limited. Forging – Where the toe of the hind shoe strikes into the underside of the front shoe. This is normally a sign that the horse is on the forehand and rushing; the front foot legs do not have the time to get out of the way before the hind foot comes through. Under Tracking: Most horses with loose, pure gaits will ‘track up’ or ‘over track’. Defined as when the hind foot steps into the foot print just made by the fore foot on the same side or when the hind foot lands in front of the print of the fore foot. When the horse under tracks, the hind foot will land short of the fore print. Tracking up can be a useful indicator of how the horse is working. The ‘medium walk’ should show a clear over-track. The working trot should track up with medium and extended trot showing over-track. Those of us who are lucky enough to not be looking to buy a new horse work within the confines of what we already have; what nature has bestowed on our horses or nurture has hindered. We put in place exercise programs for training straightness and helping our horses use their back, suppling exercises, physio and massage for stiffness, transitions and dietary decisions for energy, but when looking for a horse to purchase, no-one wants to be taking on a horse that cannot demonstrate correct the basic paces. When looking for a young horse to purchase specifically for dressage you have to look a little deeper and include ‘activity’ and pureness of the gaits. All dressage horses must have the desire to travel forward, something that should be preserved and nurtured in the training. Movements used in training should be intended to further the education and physicality of the horse. When time is taken with the training and good solid foundations are laid, the work evolves into natural brilliance not artificially produced work that lacks purity. When time is taken with the training and good solid foundations are laid, the work evolves into natural brilliance not artificially produced work that lacks purity. Yes I wrote that twice … it was worth saying twice! So, returning to the search for a backed four year old who is ready to start his/her dressage career, the depressing truth is that in the quest to produce ever more extravagant paces for dressage, breeders it would seem have weakened the back of the warm blood, the signs are there that they know what they have done and are making plans to rectify the problem but what we have is a few generations of dressage warmbloods with what can only be described as dubious longevity. Couple this with modern rugs putting pressure on the spinal processes from poll to tail, unbalanced riders imposing their less than perfect training methods, is it any wonder that my yard is full of horses on re-hab! A very, very sad situation. I am only speaking from my current experience, of seeing literally hundreds of horses in the quest for one without issue or potential issues. Can anyone persuade me otherwise? Please feel free to try, I would truly love to find a suitable horse for my friend, she deserves it. That article has truly hit home! I have been very, very lucky with my horses. I am not blessed with a large budget at all and as such have bought correct horses unbroken or just backed and produced them to Advanced Medium level. I now want to go further and have bought a dutch mare that I have started myself. She is incredibly weak so her work is limited to 20 mins per session interspersed with lunging, hacking and riding to help her build correctly. I wont ask more of her for the coming months than to stretch her neck forward to two reins and go forward. She is so adorably sweet and willing, until she builds up and finds her confidence I will not ask for roundness or anything near to it. I find too often that riders want to take the short route, get them round…NOW! No I refuse until I feel that my mare can find the rein and go forward with relative straightness. It will take me a much longer time but I hope I will have a horse that trusts the contact without feeling restricted. Her gaits are pure, she lacks forwardness under saddle but this will come with improved balance and hacking, I believe. Fingers crossed it works and that my ‘little’ Hattie who was 15.2 in Jan will stop growing so much, now in May standing 16.3… Giant baby, another reason for not pushing.